I don’t think you can beat a good bowl of soup especially when you are feeling a bit run down or it is cold, wet and windy outside. I seem to get soaked to the skin every time I take the dogs out at the moment. I come home caked in mud up to my knees, with 3 equally mucky whippets and looking like a drowned rat! So today I decided that I would cheer myself up and make a pan of my minestrone soup. 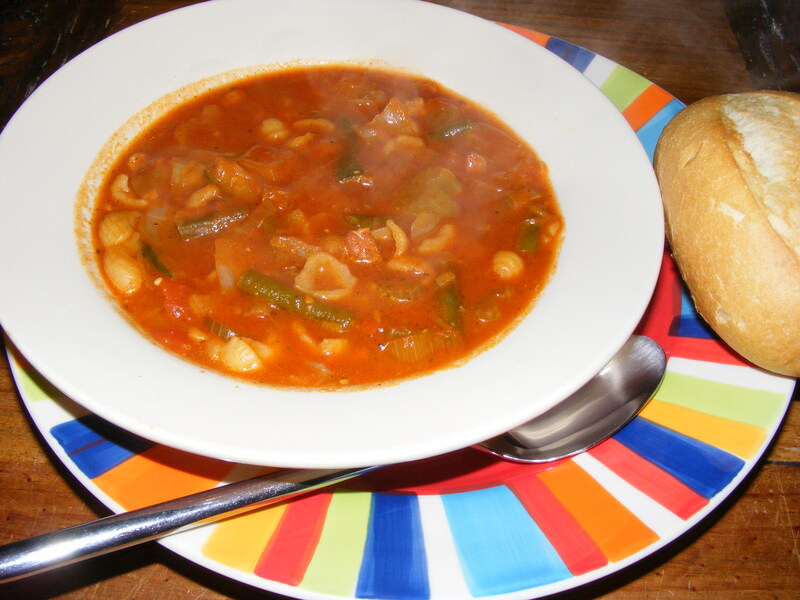 Now I am sure that the Italians out there will say that I haven’t made it right but it is MY minestrone and it is the way I like it. I have to say I haven’t had any complaints from anyone who has had it. I have been making this soup for well over 20 years since it kept me feed when I was a student in Liverpool. I would make a pot of it up and it would last 3 of us for the best part of the week. It was relatively cheap, packed full of healthy vegetables and more importantly soaked up the booze before a night out! You can, of course, make this completely vegetarian but simply omitting the bacon and that is how I used to make it but I think the bacon just adds and extra depth of flavour. Leaving the soup overnight helps the flavour to develop, that’s if you can resist it, and it freezes really well too. I love this soup and hope you will too! Add all the vegetables and stir to combine for a few minutes. Add the passata, tomatoes and stock and bring to the boil. Simmer until the vegetables are soft, about 30-40 minutes. Stir in 2 tbs pesto. Serve with a dusting of parmesan and plenty of crusty bread.